complying with and undertaking your research responsibly, following all necessary regulatory, legal and professional obligations. As a member of the academic community at Southampton, you are expected to work in accordance with these principles. For more guidance and information have a look at Skills4StudyCampus module on Referencing and plagiarism. Reference accurately in the correct referencing style. Ensure all the work you submit is distinctly your own even for group assignments. Understand the difference between getting help and collusion/cheating. Allow sufficient time to complete your assignments so you are not tempted to take ‘short cuts’. Do not recycle work – your own or others. Ensure you comply with any legal, regulatory or professional obligations. Take due care of research participants and personal data. Seek ethics approval for all your research. Unsure what the terms in the checklist above mean? Look at these definitions. For more information and resources relating to these and related topics, select from the Academic Integrity menu. 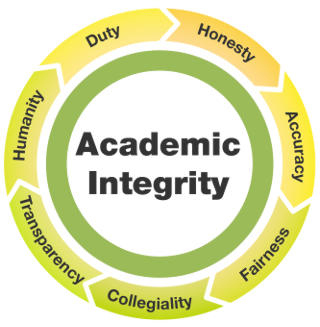 Academic Integrity Guidance for Students, by Southampton University [PDF]. Glossary of academic terms, by Southampton University [PDF]. Regulations Governing Academic Integrity, by Southampton University. Academic Integrity handbook, by MIT.